I can never have enough time travel flicks, you know that. Sure, there is bound to be a doozy here and there, but every filmmaker is different, and their vision for time travel is bound it fluctuate. I hadn’t previously heard of Frequently Asked Questions about Time Travel, but I was referred to the film by a friend, and the title alone was interesting and begged for me to check it out. 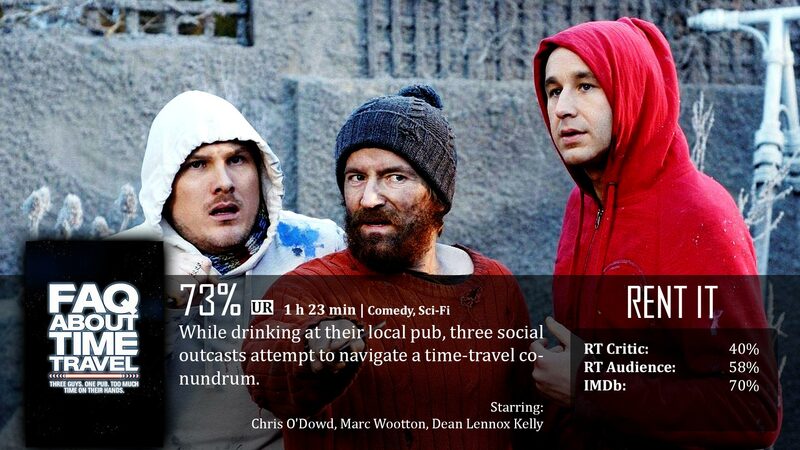 Plus, it is advertised as Doctor Who meets Shaun of the Dead. Two projects I personally am a huge fan of, so what the hey, I’m apparently on a British Comedy route anyway. Now this film is primarily about three friends: Ray, Toby, and Pete. When Ray is contacted by a future time traveler by the name of Cassie, she tells him she is a huge fan, and today is a big day for him. Ray, of course, tells his friends about the encounter, to which they laugh at him. However, when one of the friends travels to the bathroom to break the seal, he returns to find his future self killed by some tragedy that hasn’t yet happened. He brings his friends to the bathroom, where time is apparently leaking, and they see for themselves. Back and forth they go to the bathroom trying to get back to the present, but the more they go, the more they see that in the future they are icons, and the more they reach their ultimate demise. How can they possibly get out of this predicament? Have to say, the premise is really cool, and yes it does have some similarities to Shaun of the Dead, and the rest of that trilogy. What similarities? It’s British, it is a few friends, and it takes place in a pub while some weird stuff happens. How does this relate to Doctor Who? Time travel…that’s it. So you might as well say its Shaun of the Dead meets Back to the Future, or Looper, or Terminator, or…you get the picture. Doctor Who is British, so they at least have that going for them. However, if it wants to advertise as being like Shaun of the Dead, is needs to prove it apart from premise…you also need some soul. Yes, the film brings its own soul, which is great, but it doesn’t have the best pizazz, and you will have a hard time remembering the characters after the film ends. The film also doesn’t have a solid plot, which Simon Pegg never had an issue with. The plot is more or less: here’s time travel, go wild. Their main goal is to get back to the present, but that’s pretty much it, really. It’s not terrible by any means, but I wasn’t wowed. I just chuckled here and there, and once it was over, I was done. Time travel is an interesting concept, because you can do virtually anything with it and get away with it. When the guys are sent into the future where the world is apparently coming to an end, it looks really awesome outside and Ray wants to explore…I want him to explore too. Maybe it would cost too much to do, but don’t tease us and get back to what you were doing before. The actors are funny. I wouldn’t say they are drop dead hilarious, but they have their moments. Primarily Ray and Cassie shine. Not only because they are the most-known actors, but because their personalities are the most interesting and unique against the arrangement of acting coming from everyone else. The guys playing Toby and Pete weren’t horrible, I just won’t remember their faces come tomorrow. Take that as you will. Frequently Asked Questions about Time Travel is good if you’re a huge fan of time travel films or British humor, but as far as finding more films for your home collection, I wouldn’t say this is one.